Boston breaks out for six runs late in the game to clinch the division. NEW YORK — Mookie Betts and the Boston Red Sox won their third consecutive AL East championship Thursday night, clinching on enemy turf with an 11-6 victory over the rival New York Yankees. Betts homered, doubled twice and drove in five runs, finishing with four hits as the Red Sox overcame Giancarlo Stanton’s go-ahead grand slam in the fourth inning. Jackie Bradley Jr. hit a tying home run in the seventh and Xander Bogaerts put Boston ahead with a sacrifice fly. With the best record in baseball and a playoff berth already secured, Boston (104-49) closed out a once-tight division race with nine games to spare. J.D. Martinez and the Red Sox, alone in first place since July 2, will open the postseason at home on Oct. 5 against an opponent to be determined. Never before had Boston finished in first place three years in a row. The club needs one victory to match the franchise record held by the 1912 World Series champions. It took three tries, but these Red Sox finally earned their chance to celebrate at Yankee Stadium under rookie manager Alex Cora. Boston entered the three-game series needing a single victory to lock up its fourth AL East title in six years, but the Yankees put the party on hold for a few nights with two straight wins. Craig Kimbrel whiffed a slumping Stanton for the final out, and the Red Sox strolled out of the dugout to give each other hugs and high-fives in a muted celebration around the mound. They walked off the field and headed inside to cheers from Boston fans behind the third base dugout. 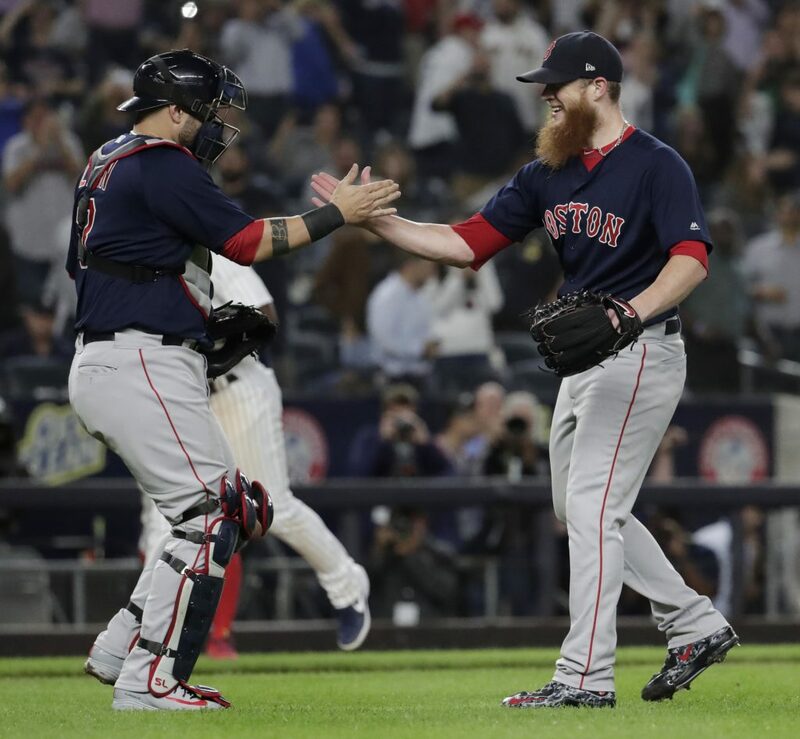 Red Sox closer Craig Kimbrel and catcher Sandy Leon celebrate finishing off the Yankees in the AL East race on Thursday night. Then, it was time to break out the bubbly in the Bronx. 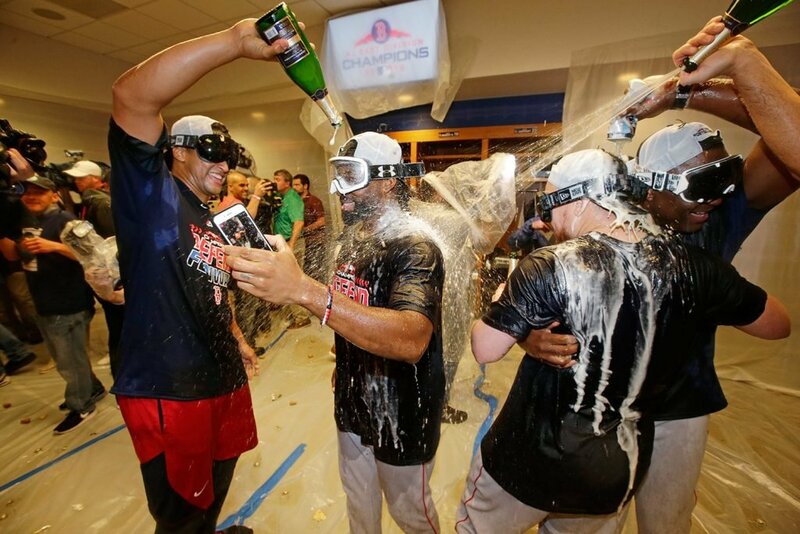 Two years ago, in David Ortiz’s final season, the Red Sox celebrated in the visitors’ clubhouse at Yankee Stadium after wrapping up the division crown in New York. But that came in the wake of a loss – after Mark Teixeira’s winning grand slam gave the Yankees a comeback win. This time, they got to do it absolutely right. After starter Eduardo Rodriguez walked a career-high seven in 32/3 innings, knuckleballer Steven Wright (3-1) worked three shutout innings for the win. Luke Voit hit a two-run homer for New York. NOTES: Red Sox: INF Eduardo Nunez (left hamstring) sat out and probably won’t play this weekend in Cleveland, Cora said. 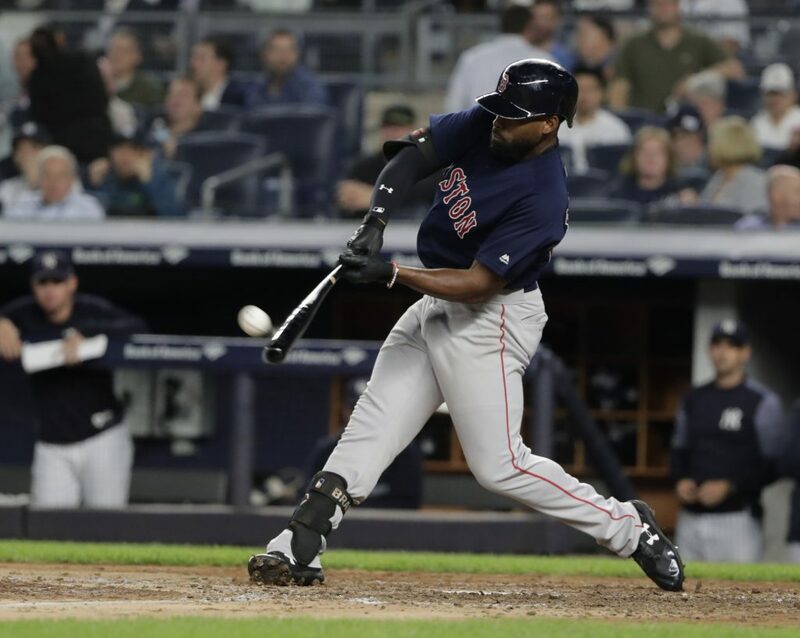 Nunez exited Wednesday night’s game in the ninth inning after legging out an infield single. … RHP Matt Barnes was available out of the bullpen for the first time in weeks. Barnes hasn’t pitched since Sept. 3 because of left hip inflammation. Cora said he wouldn’t put Barnes in a high-leverage situation right away. … Betts was the DH again but will return to the outfield this weekend, according to Cora. A top contender for the AL MVP award, Betts sat out Tuesday after tweaking his left side two days earlier. He was the DH on Wednesday. … RHP Austin Maddox had rotator cuff surgery Wednesday in Los Angeles. Expected recovery time is about a year, the team said.